Directions: Use the information from World Book Online Kids to answer the questions. 1. How long was the Titanic? 2. What day did Titanic hit the iceberg? 3. How many people were on Titanic? 4. 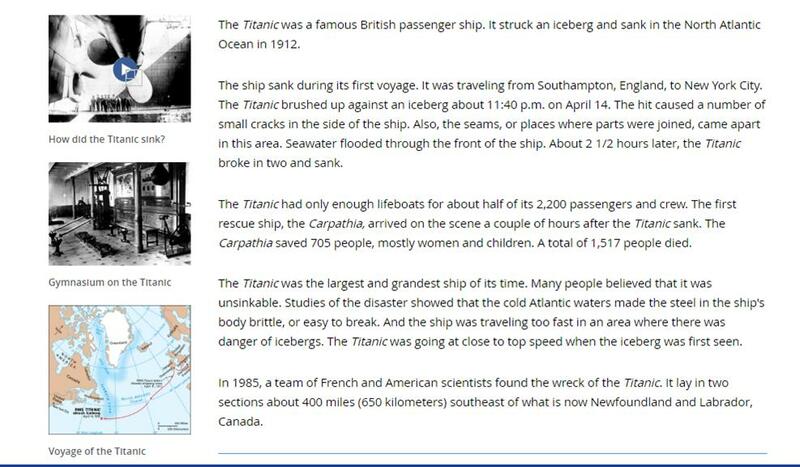 What ship rescued the survivors of the Titanic? 5. How many people died on Titanic? 6. What year did they discover the wreck of the Titanic? Directions: Use a dictionary to find the definition of each word. Remember, some words have multiple definitions. Choose the one that makes the most sense. Directions: Below is a list of some of the Titanic passengers. Choose a passenger and answer the questions about your passenger. 1. What is your passenger's name? 2. How old was your passenger? 3. What class was your passenger in? 4. What was your passenger's ticket number? 5. Where did your passenger embark? 6. What lifeboat was your passenger on? 7. Write one additional fact about your passenger. An immigrant is someone who moves from one country to another. Imagine you were moving and complete the worksheet. Imagine you were a child on the Titanic. Write a poem or short story on the paper provided about your experience.